WOMEN IN MINING (WIM) is a nationwide organization composed of individuals employed in, associated with, or interested in the mining industry. The Organization is NOT limited to women only. 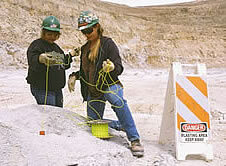 Members include engineers, geologists, land men, secretaries, lobbyists, mine workers, educators and concerned citizens. Many WIM members are business and civic leaders extending their influence and expertise into their local communities. Such varied backgrounds are extremely beneficial to the organization and members are encouraged to share this expertise and experience both formally and informally. In addition to providing valuable educational benefits, the WIM organization offers members an opportunity to become acquainted and work with others involved in the mining industry and thereby acquire new personal and professional contacts. To educate members of the technical and other aspects of the mineral resource and related industries through informative and educational programs. To institute and promote such educational, scientific, legislative and other programs as will foster public awareness of the economic and technical interrelationship of mineral production with the national economy and the public good. To preserve the heritage, and maintain the history of mining and mining people. The WIM bylaws direct the organization to devote 80 percent of regularly scheduled programs to educational subjects pertaining to the mineral resource and related industries. Each year these ongoing programs have been enhanced and have grown in scope. One of the first WIM programs to receive nationwide attention was OPERATION RESPECT, a cooperative effort with the U.S. Bureau of Land Management. OPERATION RESPECT was presented to Colorado school children to promote respect for miners’ property and equipment and to educate them about the dangers associated with trespassing on idle mine property. Since then, several WIM chapters have been involved in similar programs. These programs have been attributed with improving the safety records in mining communities around the nation. To help keep the public aware of legislative activity relating to the mining industry, WIM sponsors candidate meetings featuring candidates at the local, state and national levels, legislative update meetings, letter writing and community awareness programs. WIM chapters participate in educating elementary, junior and senior high school students about career opportunities in mining and the importance of mining in their everyday lives. Chapters sponsor college scholarships, speech contests, essay contests, provide materials for class curriculum at all grade levels, host field trips, teachers workshops and seminars, and sponsor public meetings using speakers, movies, videos and other media. Education for WIM members includes monthly meetings featuring prominent speakers who address various facets of the extractive industry, including land, geology, processing, economics and policy. The chapters sponsor field trips to local mines, power plants, coal terminals, research labs, geologic sites and mining museums. Chapter meetings also provide a vital communication link for the variety of people represented in WOMEN IN MINING. A number of personal improvement workshops are offered through WIM.